Frank Arthur Edmund Hathaway was born in West Norwood, London on 27 August 1897, the son of William Alfred Hathaway (born in New Headington in 1865 and baptised at St Andrew’s Church on 31 December) and Clara Ann Dawson (born in Ardington, Berkshire in 1864, and baptised there on 10 July). Frank’s father William Hathaway had grown up in Headington but moved to London in the 1880s to work as a milk carrier. Harry Hathaway (born in West Norwood, London near the end of 1900). Frank's parents settled in West Norwood in the Borough of Lambeth after their marriage in 1889, and the 1891 census shows them living there at 83 Rommany Road with their first child William (7 months). They shared the house with another family. Frank first appears in the census at the age of three in 1901, when he was living at 15 Chalford Road, Lambeth with his father William (35), who was employed as a milk carrier, his mother Clara (36), and his siblings Ellen (9), Albert (8), and Harry (four months). Frank's eldest brother William (20) spent census night at St Andrew's Road in Headington with his grandparents George & Eliza Hathaway. In 1903 Frank’s father William Hathaway brought his family back to Headington, and they moved into 73 Lime Walk (then numbered 43). This is the house on the south-east corner of the junction of Lime Walk and All Saints Road, and the Hathaways started selling milk here, keeping a small number of cows near the street. 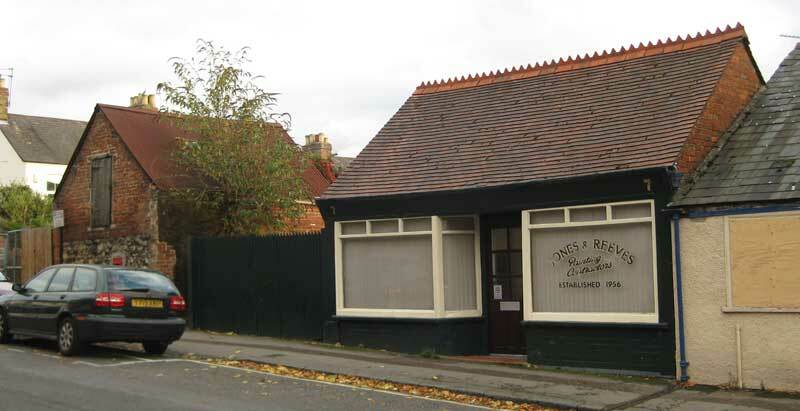 Soon they rented the Wootten’s meadow between Old High Street and Osler Road (now built up with houses, including Stephen Road), and they built a shop shown in their back garden in All Saints Road. The photograph below shows the Hathaways' dairy shop in 2012, shortly before it was demolished. The building on the left was where the horse-drawn milk carts were loaded, which explains the high door that has no steps. At the time of the 1911 census Frank (13) was still at school (almost certainly Headington National School). He was living at 73 Lime Walk with his father William (45), who ran the dairy here; his mother Clara (46); and his siblings William (20), who was a milk carrier, Ellen (19), and Frank (13). Frank was baptised as an “adult” (aged 16) at St Andrew’s Church in Old Headington on 17 June 1914. In the First World War Frank Hathaway served as a Private in 1st/4th Battalion of the Oxfordshire & Buckinghamshire Light Infantry (Service No. 5075), and was killed in action at Flanders in Belgium at the age of 19 on 16 August 1917. He is remembered on the Tyne Cot Memorial to the Missing in Zonnebeke, Belgium (Panel 96 to 98). 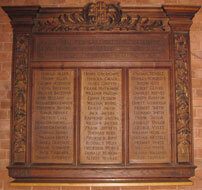 The photograph of his name on that memorial (left) was kindly supplied by British War Graves. Frank Hathaway is remembered on the roll of honour of All Saints’ Church because his home was at 73 Lime Walk; but he is also remembered at St Andrew’s Church, which he evidently attended, as he was baptised there as a youth; and also his family’s farm was in Wootten’s Meadow. William Hathaway senior was still listed as a dairyman in Kelly’s Directory for 1938. He died the following year at the Radcliffe Infirmary at the age of 73 and was buried at Headington Cemetery on 6 October 1939. In the latter days the horse and delivery cart were still kept in All Saints Road, but the milk was picked up from Burton’s Dairy depot in Stephen Road by Frank’s brother Harry, who did the deliveries. The Hathaway shop was taken over by Burton’s Dairies Ltd by 1945, and demolished in 2012. Mrs Clara Hathaway died at the age of 79 at 8 Alexandra Road (now Gathorne Road) and was buried with her husband on 30 August 1943. William Hathaway junior (born 1890) continued to work as a Headington dairyman. He married Lydia Sumbler in the Swindon registration district in the fourth quarter of 1913 and they lived at 12 Stapleton Road. Their two children were baptised at All Saints’ Church: Phyllis Joan Hathaway on 7 January 1915 and Myrtle Rose Hathaway (born 10 July 1924) on 3 August 1924. Ellen Elizabeth Hathaway (born 1891/2) married Arthur W. Coxhill in the third quarter of 1915. They had four children (births all in the Headington registration district): Joyce M. Coxhill (1916, second quarter); Reginald A. J. Coxhill (1917, third quarter); Frank E. S. Coxhill (1921, second quarter); and Hazel R. Coxhill (1923, first quarter). Albert Henry Hathaway (born 1892/3) married Amy Louisa Martin at St Matthew's Church in Fulham on 4 May 1913. Harry Hathaway (born 1900) married Olive Dorothy Gilbert at Cowley St John Church on 9 August 1923. Their son John G. Hathaway was born in the Abingdon registration district in 1924 (reg. fourth quarter).